I left the glitz and glamour of Dubai this morning and have arrived in the peace and reality of Zambia this evening. Why is it that some places just seem to pull you like a magnet? Is it a healthy dose of “the grass is greener” – or is it something more? Some form of divine connection? Or am I just reading too much into this. It has been a long day after all and I am going to sleep almost 7000 km’s from where I started. I met up with Pastor Ted and Pastor Pat McDonald (from California) at the airport in Johannesburg and we travelled on together to Lusaka, Zambia. There we were met by Rita Prins from Visionledd and Pastor Lucy from Kabwe. We are spending the night in Lusaka and will drive up to Kabwe in the morning. I can hardly wait!! I am so excited and proud of what we, as a church, have been doing in Kabwe and I am thrilled to think of the thinks that are yet to come. However, I am also excited by the possibility that we may be able to do similar things in other places around the world, as God leads and directs. I’ll leave you tonight with a rather amusing photo from the Johannesburg Airport. 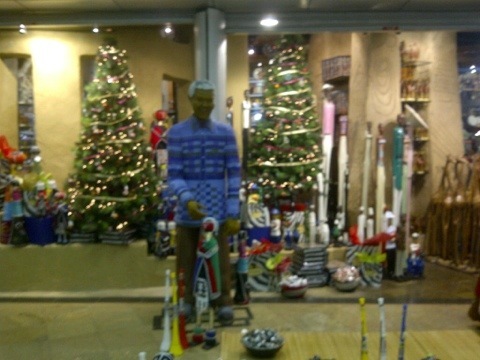 I guess this could be entitled “Santa Mandela”! 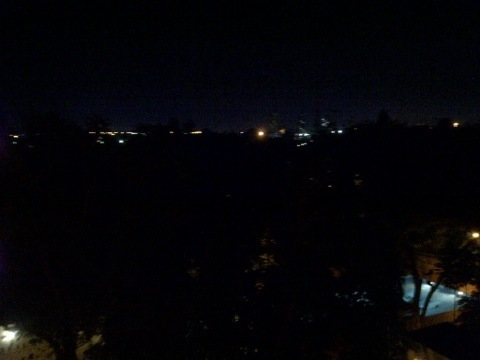 I’ll also add a quick shot from the balcony of my room here in Lusaka with the city lights in the distance. Please keep praying – for all 3 of us. I appreciate it!! Next PostNext November 5 – Goats!